Our product range includes a wide range of ornamental garden plant, bitty kanher flowering plant, amherstia nobilis plant and adenium plant. 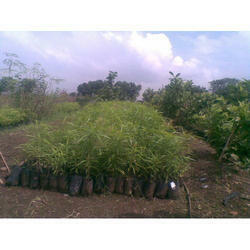 Ornamental Garden Plant is generally used in the horticultural trades. The term largely corresponds to 'garden plant', though the latter is much less precise, as any plant may be grown in a garden. Ornamental plants are plants which are grown for display purposes, rather than functional ones. While some plants are both ornamental and functional, people usually use the term “ornamental plants” to refer to plants which have no value beyond being attractive, although many people feel that this is value enough. Ornamental plants are the keystone of ornamental gardening, and they come in a range of shapes, sizes, and colors suitable for a broad array of climates, landscapes, and gardening needs. Thevetia is a genus of flowering plants in the dogbane family, Apocynaceae, first described for modern science as a genus in 1758. It is native to Mexico, Central America, South America, and Cuba. The taxonomy of the genus is controversial, with some authors including Cascabel within Thevetia, while others accept the two genera as separate. Perhaps the most beautiful of flowering tropical trees, certainly attractive enough to earn the sobriquet Queen of Flowering Trees. Obscure origins add to the mystique of this noble petite tree. It has only been collected from the wild a couple of times, in the forests of Burma, leading to its common name Pride of Burma. The tree has compound leaves and a great profusion of large, irregular, yellow-spotted scarlet flowers. The genus is named after Lady Sarah Amherst, who collected plants in Asia in the early Nineteenth century. Not only is she commemorated in one of the most beautiful of the worlds trees, she also lends her name to Lady Amherst pheasant one of the most elegant birds. The new leaves are produced in flaccid pale tassels that turn purplish before they green and open out. When not in flower, Amherstia looks similar to Saracca, another Asian legume genus. The leaves unfurl in handkerchief fashion like the Brownea and Maniltoa. New leaf growth is reddish, hangs down at first. 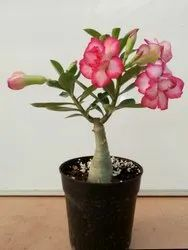 Adenium Plant is grown as a houseplant in temperate regions. Numerous hybrids have been developed. Adeniums are appreciated for their colorful flowers, but also for their unusual, thick caudices. 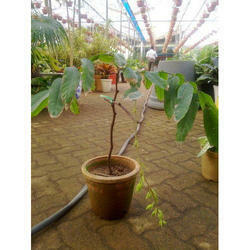 They can be grown for many years in a pot and are commonly used for bonsai. The plant needs a good quality, coarse potting mix of 65% perlite, 5% rock, 5% sand and 20% top soil with coir or a small percentage of peat. Do not add fertilizer until the plant has been in the pot for 2 to 3 months. 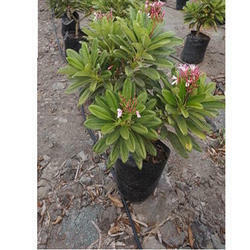 Planting adeniums, desert rose plants, in the ground is a bit different than in pots. Make sure you put 3 inches of rock in the bottom of the hole for drainage and then use the soil as described. Remember using regular potting mixes and top soils will cause root rot! Looking for Ornamental plant ?